At the moment I’m embroiled in the London election campaign as the Green Party’s candidate for Mayor and its lead candidate for the London Assembly. It’s the second time I’ve stood for Mayor but 2016 already feels very different from when I last stood in 2008. It’s easy to think your own times are the most interesting, but this really is an exhilarating time to be involved in politics. With the rise of Jeremy Corbyn, Podemos and Syriza, unpredictable things are now becoming a reality, as candidates who started off as massive long shots sweep to victory in elections around the world. In Britain in particular, this current wave of activism has a great history of dissent and radical change behind it. The many different people who have made Britain their home over the centuries have debated, argued and ultimately collaborated in countless amazing ways, forming trade unions, co-operatives and the National Health Service, to name but a few. All change requires a catalyst, and this is currently being provided by widespread disgust at the concentration of extreme wealth in fewer and fewer hands, directly supported and encouraged by the establishment. The destruction of council housing, high rents, and an out-of-control property market are drawing together many formerly disparate groups, now united by a crisis of living costs which in London is more acute than ever before. Combine this with the disproportionate representation of big business in every sphere of government, the shattering of workers’ rights, the financial attack on further and higher education, and the blatant disregard for the health of our immediate environment and the wider planet, and it’s no wonder we have a growing demand for fundamental change at a grassroots level. Politics should be about representation, enfranchisement and participation. However, the current government seems increasingly in thrall to money and the exercise of power for the sake of it. The opposition at the last election failed to offer a plausible strategic vision for the future direction of the country, which left the gates open for the surge of the Greens nationally and the SNP in Scotland. Both parties are now rejuvenated with a massively increased membership. The reaction – both within and outside the Labour Party – to a similar surge in membership and the election of Jeremy Corbyn as party leader shows that those in power are still fighting hard to protect their current positions. There is no real belief in greater political engagement among the old guard of the established parties because they fear the loss of power that might come with embracing a more inclusive and representative future. I support Caroline Lucas’s proposals for an alliance at the next General Election aimed at changing the electoral system for good. In my view this is our best chance of cementing a new form of politics in place, even though I strongly believe that while inequality continues to rise we’ll continue to see new surges into activism and politics of all kinds. As a Green seeking elected office, I will continue to push for a fairer voting system while doing all I can to increase our influence within the current one. The London Assembly election this year is rightly based on proportional representation and by again ensuring a strong voice for the Greens we can help to bring a wider range of views to the fore in our city. However, while changing our electoral system will undoubtedly be transformative, for me the most important element contributing to a deep and lasting change in politics is the involvement of young people. It is young people today who will bear the long term brunt of the decisions being made by today’s politicians but I feel we have reached a particularly significant moment. Whether it’s a direct attack on their own futures from stamping out student grants and support for nurses in training, or the long term attack on the fundamental health of our planet, activism from young people against the callous actions of the establishment is growing, despite the growing pressures on their time and money just to survive. I believe this activism could be growing faster. I’m a councillor in the London Borough of Camden, where we have a truly diverse range of representatives. I’m hopeful that this year’s London elections will drive a further wave of political engagement in young people, but there is much still to do. The average age of a local councillor in the UK is now 60, and interest and turnout in local elections is dismal. I’ve recently been talking to a wide range of groups working to engage more young people in politics and what I always tell them is that the future of politics has to look and sound like them. They need to get involved. But I know from the TV news and the dreadful state of debate on programmes like Question Time that they can be forgiven for thinking that politics is all about being able to argue, talk over people and mock your opponent, instead of being able to put forward good, necessary ideas that will bring about change. I’ve always been a campaigner as well as a politician and was galvanised into standing for election by working first on trying to change things one issue at a time. This is the route I recommend to today’s young people too, rather than the well-worn, traditional path through the debating societies. My hope for a deep transformation of politics lies in activism. Working to make change happen through campaigns, direct action, public mobilisation and lobbying the current crop of politicians will teach you more about how things work than any degree in politics or course on rhetoric. In my view the continued fixation on rewarding middle-aged, middle-class eloquence leads to a lack of diversity and a dangerous deficit in proper representation in our council and parliamentary chambers. 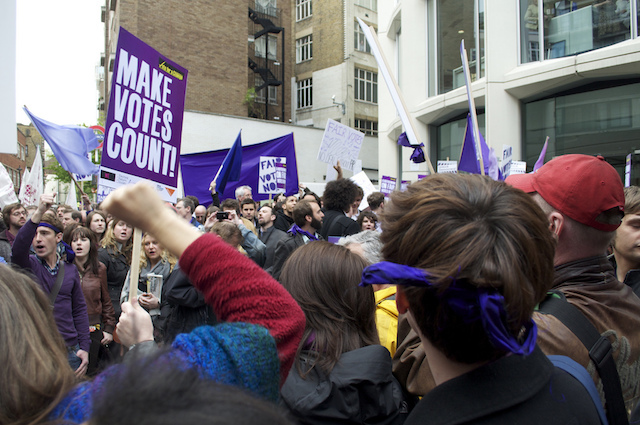 The future of politics lies not just in encouraging the simple act of voting but in mobilising more of our young people who feel alienated by the current state of politics into campaigning on issues that matter to them – and when they realise they’d do a better job than the people they are lobbying, they will join parties and become candidates themselves. Compared with 2008 the political landscape has changed so much and even after successive waves of new activists and party growth I am sure there are more surges to come. It’s clear to me that the young and the marginalised should be the next surge and that the political field remains wide open for them to win. Sian Berry is the Green Party candidate for Mayor of London. A former principal speaker of the party, she is also its lead candidate for the London Assembly. She worked until recently at the Campaign for Better Transport.